: Board Collector: Is Peter Schroff shaping again? Is Peter Schroff shaping again? Just spent an enjoyable hour looking at your well-done blog (which I found from a link from "Board Riding Scooter Trash" outta Dunedin, NZ). Never got into thrusters and can't say I hold 80s graphics dear, but I appreciate the trip down memory lane and your enthusiasm is infectious. I found an Eberly lightning bolt a few years ago at a second hand store here in San Francisco, which I bought for 75$. 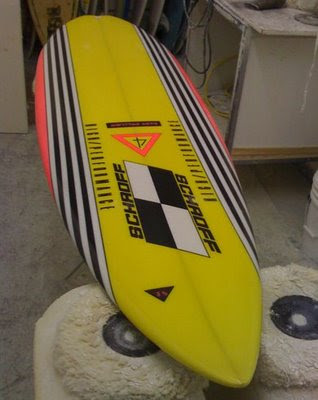 I surfed it enough to satisfy my memories about single fins (I'm in love with my Steve Brom fishes). I had some chump scold me for actually riding it and not locking it in a climate-controlled case or something ("Do you even realize what you HAVE?"). One thing I like about your collection is that you buy them to ride them! Here here!